The single parts of the defences at Lorient have the designation "Lo". Over 400 St bunkers were built here. The American army reached Lorient in august 1944, but did no pursue and the occupants of the fortress did not surrender until May 1945. The civil population had been evacuated earlier. The installations in the harbour were, due to heavy aerial attacks, merely operational. The border of the Küsten Verteidigungs Gruppe follows the river "Läita" in the north, passes Pont-Scorff, Caudan, Auray, Hennebont and so south back to the coast until the river "Étel". 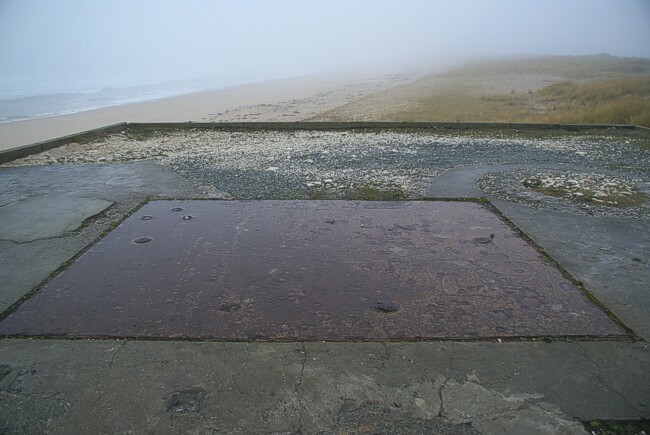 The long beach "Polygone" not well known, but it has many bunkersites, which all can be visited freely. Behind these dunes we found a secondary defence line. We made the trips in 1998, 2003, 2005, and 2006. Additional pictures Henk Adriaanse, 2005 and 2008. The highlight is this complete 624 in Kerdanvé, Polygone.